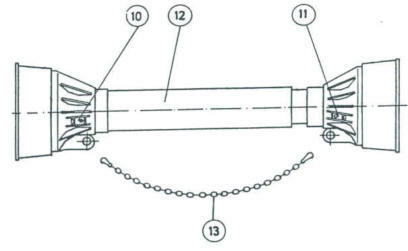 M1 shafts are used on small timber winches and centrifugal fertilizer spreaders. Transmittable horse power at 540 rpm is 16hp, at 1000 rpm 25hp. M1-27 Min. length 27 ½". Max length 36". Six spline 1 3/8" ends. 11 lb. M1-40 Min. length 40". Max length. Six spline 1 3/8" ends. 16 lb.